BP Pushes Doctored Image of "Command Center"
A photo posted by BP supposedly showing the company's oil spill command center was really a Photoshopped collage and may have been based on a shot taken in 2001. The image was posted on BP's Web site and was distributed by the Associated Press - which charged $35 for it - and possibly other news services. It appeared prominently on CBSNews.com. 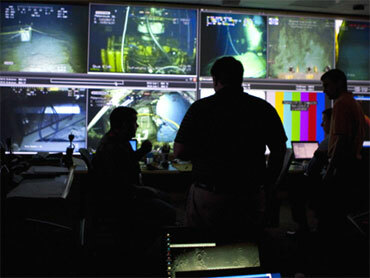 The image showed the silhouettes of three men (or two in a cropped version) sitting in front of a bank of screens showing underwater operations around the busted BP oil well that has caused one of the biggest environmental disasters in U.S. history. Sloppy jagged edges around the men's silhouettes and the edges of the screens suggest that some of the screen images were added to the photo for effect. Blogger John Aravosis, who first first reported on the faked picture Monday night and on Tuesday pointed out evidence that another BP photo was faked. BP responded by posting what it said was the original, unedited photo, showing several blank screens. A spokesman, speaking to the Washington Post, blamed the photographer for inserting the screen images and insisted BP had done nothing wrong by pushing the altered photo. But Aravosis has raised additional questions. Data embedded in the digital image indicate that it was originally taken in March, 2001. And a professional photographer would likely have done a better job of Photoshopping the additional material into his original photo.